All will gladly hail these flavorful BOCA Burgers, made with a creamy Caesar dressing and served on sliced French bread. Grill burgers 8 min. or until cooked through (160ºF), turning after 4 min. Meanwhile, toss lettuce with dressing. 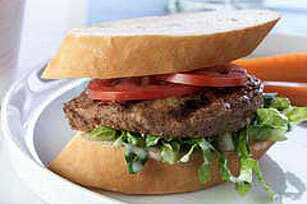 Fill bread slices with lettuce mixture, burgers and tomatoes to make 2 sandwiches. Prepare using BOCA Meatless All American Flame Grilled Burgers. Omit bread. Place lettuce mixture on 2 salad plates; top with tomatoes and grilled burgers. Serve with assorted cut-up fresh vegetables.